Naomi Celestin and Dustin Headrick's design duet produced these guitar pick pendants. From "I Got You Babe" to "Under Pressure," music is full of famous duets. Reclaimed guitar jewelry designer Naomi Celestin and artisan pick maker Dustin Headrick struck up their own when they met at a trade show and combined their crafts to create these unique mixed metal pick pendants. 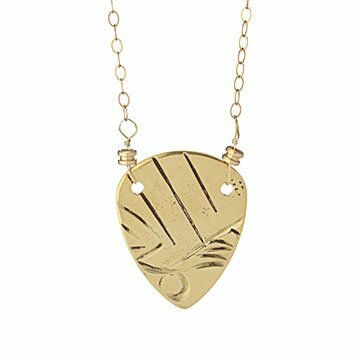 Each one-of-a-kind composition features one of Dustin's signature picks made from reclaimed antique trays and platters, paired with Naomi's guitar string ball ends, findings, and gold-filled or sterling chains. The design highlights the decorative metalwork of the original trays and platters, making a striking statement piece for any music fan. Handmade in New Orleans by Naomi and a small team of women artisans.